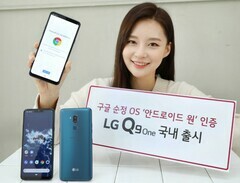 If the "new" LG Q9 One seems to have an outdated processor, the reality might surprise you: this handset is a rebranded LG G7 One, which was unveiled at IFA 2018. The only noticeable difference is that the Q9 One comes loaded with Android 9.0 Pie out of the box (the G7 One arrived with Android 8.1 Oreo onboard). Those waiting for the LG G8 ThinQ should wait just a bit longer because LG's latest smartphone is far from "new" if we skip the software department. If the fact that a smartphone that launches now has a Qualcomm Snapdragon 835 processor looks like a typo, be sure that this is correct — what we have here is a rebranded LG G7 One with Android 9.0 Pie onboard that carries the LG Q9 One label. Leaving aside the slightly outdated processor mentioned above, the LG Q9 One sports 4 GB of memory, 64 GB of internal storage, a microSD slot, a 6.1-inch FullVision display with 3,120 x 1,440 pixels, and two cameras with nothing special (8 MP front shooter, 16 MP on the back). There is also NFC connectivity, a Google Assistant hardware button, USB Type-C, and the other usual options for a premium mid-range device. The phone comes with a 3,000 mAh battery with Quick Charge 3.0 support. In South Korea, the price of this handset is equivalent to more than US$530. However, the fact that the Q9 One is rated both IP68 and MIL-STD 810G for protection from various hazards adds quite a bit to its value. The Moroccan Blue variant will go on sale in South Korea on February 15 exclusively via the LG U+ carrier.